The 1994–95 FA Premier League (known as the FA Carling Premiership for sponsorship reasons) was the third season of the Premier League, the top division of professional football in England. Just before the start of the 1994–95 season, the English transfer record was broken when Blackburn Rovers paid £5 million for 21-year-old Norwich City striker Chris Sutton. But that record was broken again in January when Manchester United paid £6 million for Newcastle United's Andy Cole, in a deal which also saw £1 million-rated Keith Gillespie move to Newcastle. Other significant transfers before and during the 1994–95 season included: Vinny Samways (Tottenham to Everton, £2 million), David Rocastle (Manchester City to Chelsea, £1.25 million), Jürgen Klinsmann (Monaco to Tottenham Hotspur, £2 million), John Scales (Wimbledon to Liverpool, £3 million) and Paul Kitson (Derby County to Newcastle United, £2.2 million). The title race was won by Blackburn Rovers, whose last title success was in 1914, and also was Blackburn's first major trophy in 67 years (last 1927–28 FA Cup).Kenny Dalglish's side secured the championship on the last day of the season despite losing 2–1 at his former club Liverpool, as Manchester United could only manage a 1–1 draw at West Ham. 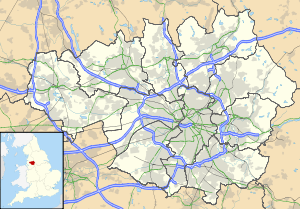 This meant that Blackburn Rovers qualified for the European Cup for the first time in their history, while Manchester United finished second earning a UEFA Cup place. A single point separated the two sides, who for more than half of the season enjoyed a wide gap in terms of point between themselves and the rest of the league, despite the likes of Nottingham Forest, Liverpool and Newcastle United briefly topping the league during the first three months of the season. 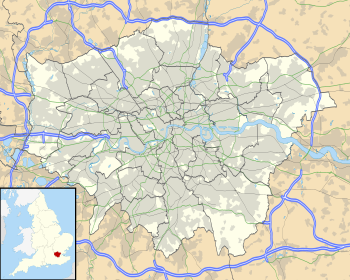 Also qualifying for the UEFA Cup were Nottingham Forest (who finished third in their first season back in the Premier League), Liverpool (who finished fourth and won their fifth League Cup in the club's first full season following the appointment of Roy Evans) and fifth placed Leeds United. The number of teams in the league for the following year would be reduced to 20. This was to be achieved by increasing the number of teams facing relegation to four, and reducing the number of teams being promoted from Division 1 to two. In January 1995, Manchester United's 28-year-old French striker Eric Cantona (then holder of the PFA Players' Player of the Year award) assaulted a Crystal Palace fan in his team's 1–1 draw at Selhurst Park. Cantona was banned from football for eight months, fined £20,000 and sentenced to 14 days in prison. The prison sentence was later reduced to 120 hours community service on appeal. Chelsea midfielder Dennis Wise was convicted of criminal damage and assault, relating to a fight with a taxi driver in London. He was given a three-month prison sentence but the conviction and prison sentence were quickly overturned on appeal. Arsenal midfielder Paul Merson admitted in November 1994 that he was an alcoholic and was also addicted to cocaine and gambling. He underwent a three-month drug rehabilitation programme before being allowed to resume his playing career. Crystal Palace striker Chris Armstrong failed a drugs test in February 1995 but admitted that he had done wrong and returned to action after just four weeks undergoing rehabilitation. Armstrong was Palace's leading goalscorer in 1994–95, helping them reach the semi finals of both domestic cup competitions, but was unable to prevent them from being relegated back to the First Division just one season after winning promotion. Arsenal manager George Graham was sacked in February 1995 after nearly nine years in charge, when it was revealed that he had accepted an illegal payment of £425,000 from Norwegian agent Rune Hauge relating to the purchases of Norwegian and Danish players Pål Lydersen and John Jensen three years earlier. Graham was later banned from football for one year by the FA. Twenty-two teams competed in the league – the top nineteen teams from the previous season and the three teams promoted from the First Division. 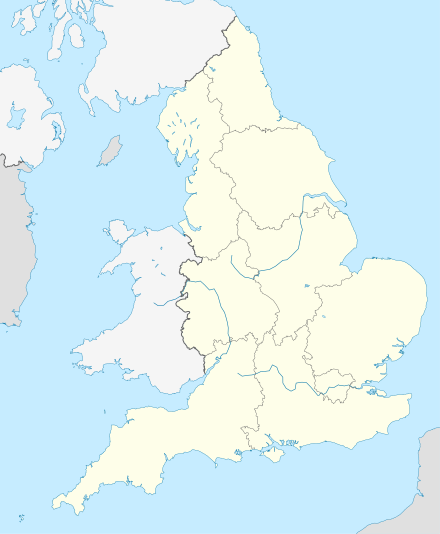 The promoted teams were Crystal Palace, Nottingham Forest and Leicester City. Crystal Palace and Nottingham Forest immediately returned to the top flight while Leicester City returned after a seven year absence, playing in the Premier League for the first time. They replaced Sheffield United, Oldham Athletic and Swindon Town, ending their top flight spells of four, three and one year respectively. ^ Due to Wimbledon lacking a home stadium, they played their home games at Selhurst Park, which is the home stadium of Crystal Palace. ^ Leeds was rewarded entry to the UEFA Cup through UEFA Fair Play ranking. ^ Everton qualified for the Cup Winners' Cup as FA Cup winners. 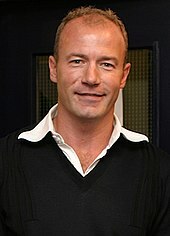 Blackburn's Alan Shearer was the top scorer in the 1994–95 Premier League season, with 34 goals. 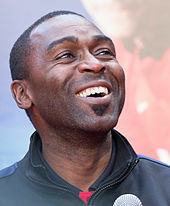 In addition to his hat-trick, Manchester United's Andy Cole became the first player to score five goals in a Premier League match. 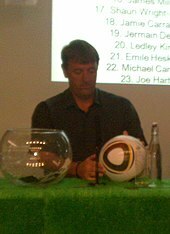 Southampton's Matt Le Tissier assisted 15 goals for the club in the 1994–95 Premier League season. Tottenham's Jürgen Klinsmann was the inaugural Player of the Month. ^ a b c d "English Premier League 1994–95". statto.com. Archived from the original on 19 February 2015. Retrieved 19 February 2015. ^ a b "Premier League 1994/1995 – Attendances". Retrieved 21 April 2015. ^ "Blackburn Rovers winning the Premier League might never be surpassed". The Telegraph. Retrieved 30 November 2017. ^ "Liverpool 2 Blackburn 1". LFC History. Retrieved 30 November 2017. ^ Barton, Mark (29 August 1994). "Football: Sutton punishes sorry Coventry: Rovers leave it late". The Independent. London. Retrieved 13 July 2009. ^ McNulty, Phil (25 February 2004). "The hat-trick Hall of Fame". BBC Sport. Retrieved 13 July 2009. ^ Smith, Rory (8 May 2009). "Manchester United v Manchester City: Five classic derbies". Daily Telegraph. London. Retrieved 13 July 2009. ^ "Tottenham Hotspur 4–2 Newcastle United". Soccerbase. Archived from the original on 3 May 2005. Retrieved 14 July 2009. ^ "West Ham United 3–0 Manchester City". 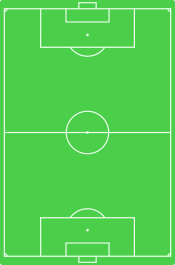 Soccerbase. Archived from the original on 26 August 2005. Retrieved 13 July 2009. ^ Hodgson, Guy (3 January 1995). "Blackburn put clear by superb Shearer". The Independent. London. Retrieved 13 July 2009. ^ "Liverpool 4–0 Southampton". Soccerbase. Archived from the original on 27 August 2005. Retrieved 13 July 2009. ^ Bramwell, Neil (12 February 1995). "Seven up for Villa". The Independent. London. Retrieved 14 July 2009. ^ "A nightmare revisited". BBC Sport. 3 July 2000. Retrieved 14 July 2009. ^ Tyler, Martin (23 April 2009). "Andrey the giant". Sky Sports. Retrieved 13 July 2009. ^ Allsop, Derick (6 April 1995). "Yeboah's hat-trick buries Ipswich". The Independent. London. Retrieved 13 July 2009. ^ Houston, Bob (16 April 1995). "Hat-trick is the Wright response". The Independent. London. Retrieved 14 July 2009. ^ "Statistical Leaders – 1993". Premier League. Archived from the original on 24 June 2017. Retrieved 5 May 2018.